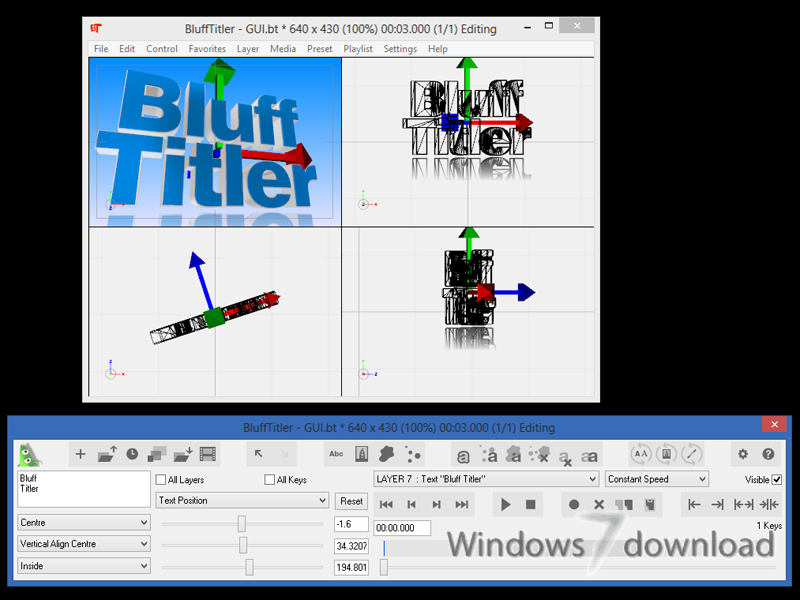 The BluffTitler user interface is simple but effective: it features a 3D render window and a 2D tool window. 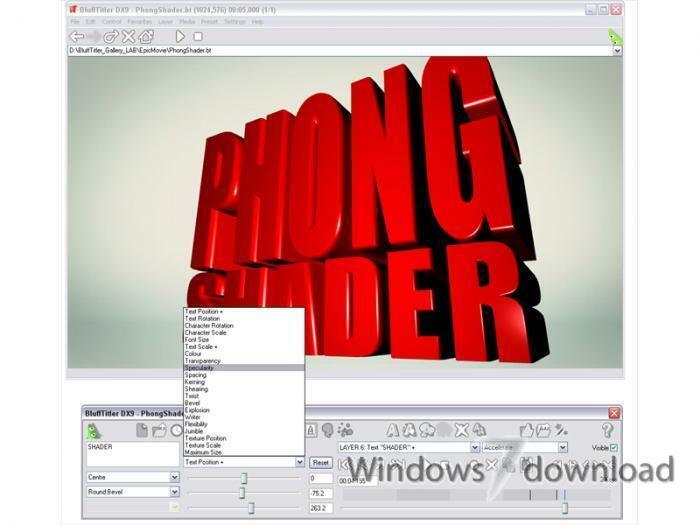 You can resize the render and tool windows with your mouse, making them fit on any desktop. Power buttons are added if there is place for them. Up to 4 viewports can be rendered at the same time. This screenshot shows the perspective, front, right and top views. BluffTitler features a browser toolbar containing the 5 classic browser buttons: back, forward, refresh, stop loading and home. The browser toolbar can be turned on/off with the menu item Settings > Browser Mode. 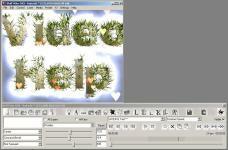 A BluffTitler animation is built out of layers that can be animated independently. Layers can be selected with the dropdown listbox above the Play button. 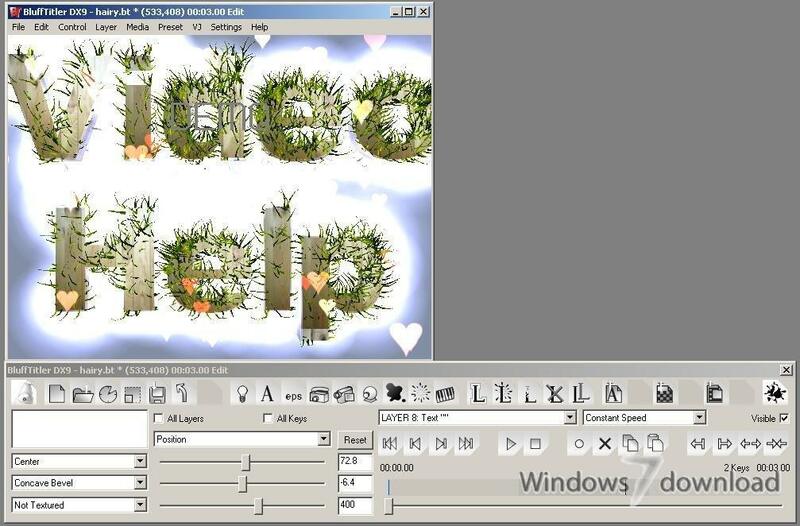 You can add a new layer with a submenu of the Layer > Add Layer menu. A layer has properties that can be keyframed. Properties can be selected with the dropdown listbox above the 3 sliders. In the resolution dialog you can enter any resolution and aspect ratio you like. Presets are available for the the most common resolutions. 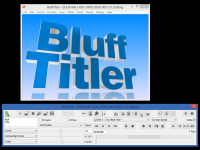 BluffTitler can create videos in all HD resolutions, even if your desktop isn't big enough to dispay them. 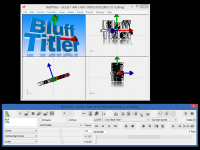 BluffTitler supports DirectX effect files for advanced graphical effects like bump mapping, tonal art mapping, phong shading and cube mapping. Animations can be exported as AVI files for further processing in NLE tools. The font dialog also allows you to set the character set and kerning method. You can stretch/extend or shrink/crop the show to the new duration. All BluffTitler reviews, submitted ratings and written comments become the sole property of Windows 7 download. You acknowledge that you, not windows7download, are responsible for the contents of your submission. However, windows7download reserves the right to remove or refuse to post any submission for any reason. 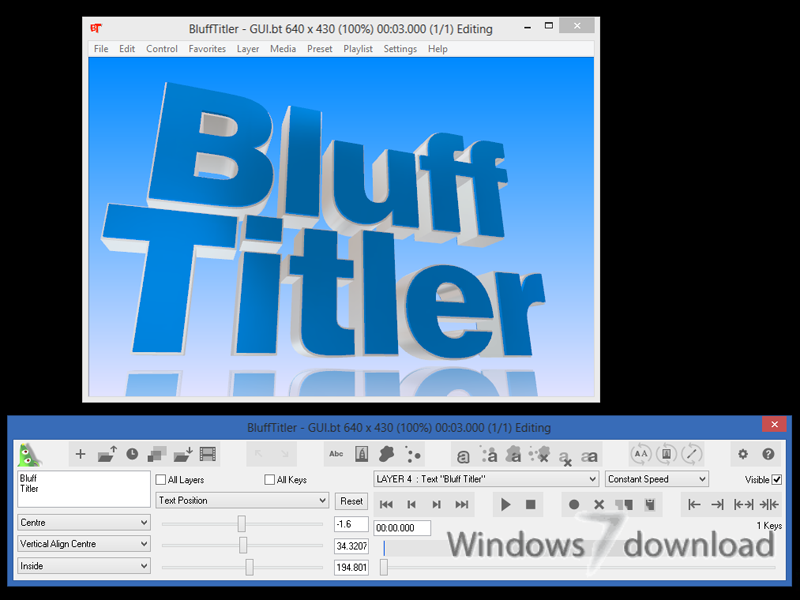 Windows 7 Download periodically updates pricing and software information of BluffTitler full version from the publisher, but some information may be out-of-date. You should confirm all information. Using warez version, crack, warez passwords, patches, serial numbers, registration codes, key generator, pirate key, keymaker or keygen for BluffTitler license key is illegal and prevent future development of BluffTitler. Download links are directly from our mirrors or publisher's website, BluffTitler torrent or shared files from free file sharing and free upload services, including Rapidshare, MegaUpload, YouSendIt, SendSpace, DepositFiles, DivShare, HellShare, HotFile, FileServe or MediaFire, are not used.